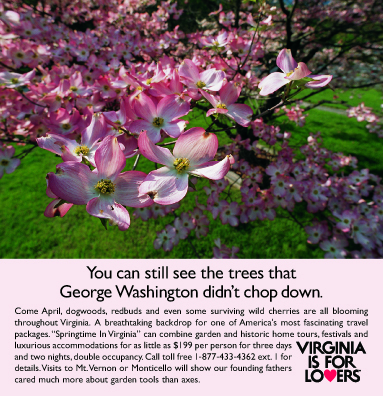 This campaign, done for the venerable Virginia Tourism brand, is one of my favorites because my creative partner and I authored every piece that went into the mix. TV and radio, print and Internet, events and PR, signage, marketing plans, speeches, parties, billboards and buses—over the course of two years, we produced award-winning work across every market segment for local, national and international audiences. Below are a few of the pieces that demonstrate the scope of work. A billboard for the Marriott Marquis in Times Square. A tour bus we had painted to use for magazine ads, conventions, and PR events on the East Coast. This was part of an effort to influence the motorcoach market. If you were on a long road trip to play golf in the Carolinas, you saw this billboard. This poster was an accurate ruler, measuring 6’7" tall, that hung in the elevators going to skyboxes at the Verizon Center. Passengers interacted with the poster by measuring themselves in comparison to basketball players, historic persons, mythical figures, and Virginia’s attractions. Part of a sports marketing effort, a radio campaign aired during coverage of the Wizards’ games. Seasonal consumer travel packages were a large part of the marketing mix. And the campaign included messages for meeting planners and other industry-specific markets.